A chemical weapons watchdog says it has found no evidence of nerve gas at the site of a suspected chemical weapons attack in Syria’s Douma. The Organization for the Prohibition of Chemical Weapons (OPCW) said Friday that its fact-finding mission had instead found traces of a more simple substance, chlorine, possibly used in the area. The group visited Douma, interviewed witnesses and collected samples roughly a week after the alleged chemical attack in Douma in the Eastern Ghouta region near Damascus on April 7, 2018. Dozens of civilians were reportedly killed in the attack which the US and its allies were quick to blame on the Syrian government. Syria and Russia said no chemical attack happened and the incident was staged by a foreign intelligence agency to pressure Damascus in the face of army advances against foreign-backed terrorists. In its report, the OPCW noted that its designated labs conducted an analysis of the prioritized samples. Two samples from gas cylinders recovered at the scene tested positive for chlorine, but there was no evidence of nerve agents. “The results show that no organophosphorus nerve agents or their degradation products were detected in the environmental samples or in the plasma samples taken from alleged casualties. Along with explosive residues, various chlorinated organic chemicals were found in samples from two sites, for which there is a full chain of custody,” read the report. The Hague-based OPCW further noted that it was too early to come to conclusions about the Douma incident. “Work by the team to establish the significance of these results is ongoing. The FFM (fact-finding mission) team will continue its work to draw final conclusions,” it said. Friday’s report came a few days after the OPCW’s member states voted to give the agency new powers to apportion blame for chemical attacks. One week after the Douma incident, the US, Britain and France launched a coordinated missile attack against sites and research facilities near Damascus and Homs with the purported goal of paralyzing the Syrian government’s capability to produce chemicals. They carried out the attack on the basis of an allegation without any proof – even ignoring calls by Syria and Russia to send independent investigators to the alleged site of the attack. “The UK publicly supported the White Helmets that are a branch of al-Qaeda and al-Nusra in different areas of Syria. They (the British) spent a lot of money, and we consider the White Helmets to be a PR stunt by the UK,” he added. Assad also stressed that the Douma chemical attack was “a lie” aimed at undermining his government. 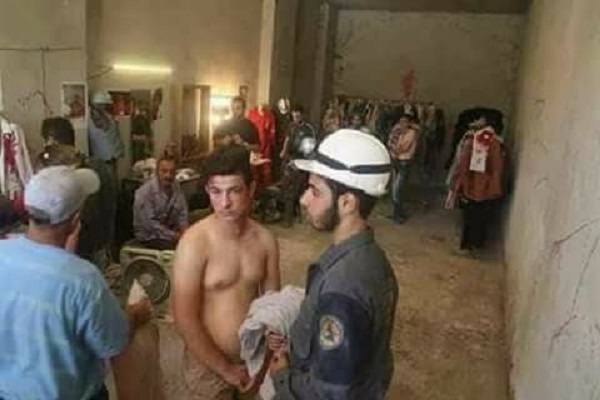 There have been numerous reports suggesting that foreign-backed Takfiri terrorists in Syria have sophisticated chemicals and are using them against civilians in the war-torn country. Last month, American investigative journalist Seymour Hersh told Russia’s RT television network that Saudi Arabia and Turkey were providing al-Nusra Front terrorists with the basic chemicals used for sarin gas. The sarin gas used in the deadly 2013 chemical attack in the Damascus suburb of Ghouta “was not the same as in the Syrian military,” he said.